Weekend one of Coachella 2019 is over, and we’re officially spray-tanned knee-deep in festival beauty inspiration—glitter, braids, cowboy boots, and every wide-brimmed hat and tinted, teeny sunnie in all the land. Of course, we still have a ways to go with weekend two and other noteworthy festivals like Stagecoach, New York Governor’s Ball, Lollapalooza, and Afropunk in the near, not so distant future, but we figured we might as well get the show on the road concerning our hair and makeup themed ode to festival beauty. In addition to this past weekend’s headliners like Kacey Musgraves, Janelle Monáe, Ariana Grande, and Selena Gomez (surprise!) festival goers, true to form, have been serving up an onslaught of spring and summer-themed beauty inspo as well. 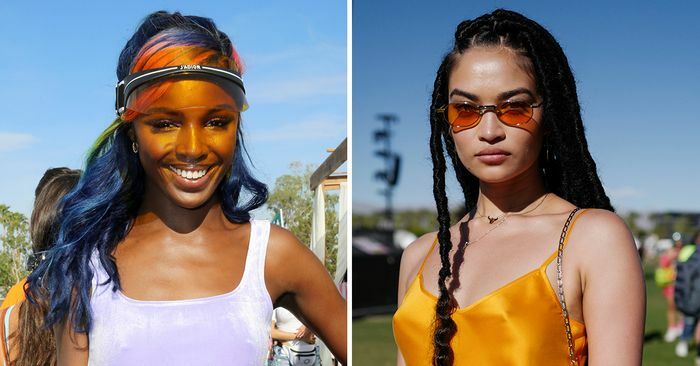 Sure, glitter and inch-thick liner might be a little OTT for your everyday summer wear, but there’s no doubt the celeb and influencer-studded crowds at Indio get us in the mood for all things summer—our fashion, makeup, and hair aesthetic included. Ready to see all the best looks we currently have saved to our camera roll? Keep scrolling to see each and every Coachella 2019 beauty look that has made our jaw drop and our iPhone-glued thumbs work faster than we ever thought possible.